We had BEAUTIFUL weather for it! It was about 60 degrees when we started and sunny. I ran the Prairie Fire Half in Wichita (an hour from where I live). The course was pretty flat and fairly shady. I was a bit nervous, but my mom and I settled into a nice rhythm early on and stuck with it for the first 6 miles. I tell ya, the first 6 miles felt really easy. A year ago if you would have told me those words would be coming out of my mouth, I would’ve said you were crazy! I could barely run 4 miles last summer, so to ever think 6 as easy shows how far I’ve come in my running! From 9-13, we had slowed down to about 13:30 or so. The hardest parts were between 10.5 and 11 (I thought that water station at mile 11 would never appear!) and between 12.5 and the finish line. My phone told me “You are at 12.6 miles” and I thought, “Dang! Where is that finish line??? ?” The last mile was also asphalt, with zero shade and it felt downright HOT! But, I’m happy to say, I crossed the finish line upright and running, lol. I did take some walking breaks during the last 6 miles. I have longer legs than my mom, so I would gradually pull ahead and then power walk to let her catch up. You know what was the sorest part of my body on Monday? My JAW! Yeah, seriously. My quads were a bit sore, but nothing bad and all of my joints (knees, hips, ankles) felt perfectly fine, but my jaw! I always chew gum when I run (keeps my mouth from getting dry) but it’s not use to chewing gum for 3 hours straight, apparently. 3 hours, 1 minute and 24 seconds. We were VERY pleased with that! We were not out to beat any particular time and based off our 11 mile training run, we figured it would take us about 3 hours and 15 minutes to complete the race. Well, two weeks ago after our last long training run, I would have said absolutely not. I love the fact that I did something that not many people can do and that I pushed my body to do something that I didn’t think it was capable of! It’s a high that I wouldn’t mind repeating. OK, so here is what my training looked like from January to race day. First off, I mostly trained using the Galloway method (this link takes you to the book on Amazon that I read!) (running/walking intervals) with an interval of running 3 minutes and walking 1 minute. Well, the last couple weeks of training, I started completely running the first 3 miles, then doing looser, longer, untimed intervals. When we actually ran the race, we ran to each water station (about every two miles), drank our water (my mom drank gatorade) walked for a little bit (maybe a couple minutes or less? ), then ran to the next station. Like I mentioned before, I took some walking breaks to let my mom catch up, but they weren’t timed. My mom pretty much ran the whole thing. To give you a timeline, the race was scheduled for May 8 and I started training the first week in January. I had not run since the previous July. I’m typically a spring runner and I am NOT fast! Prior to this I had only completed a few 5Ks with an average pace of 12 minute miles. Week 1 (first week in Jan): ran 3 times of about 2 miles each time. I was just trying to condition my body to running again after a 6 month break. Week 2: ran 2 miles twice, then ran 3 miles on the weekend. Week 3: took 2 30 minute runs (approx 2.5 miles) then ran 4 miles on the weekend. From there on out, my training was one week, running 3 times for about 30 minutes each time and then the next week, run 30 minutes twice with a long run on the weekend, increasing each long run by one mile. So, every two weeks I took a long run and every week I ran three times. Does that make sense? I kept that up until my 9 mile run. Then because of scheduling, we decided to skip the 10 mile run, run 6 miles instead and take an 11 mile run 2 weeks before the race. Also, the last month before the race, I took a 6 mile run once a week with 3 mile runs in between. The week before the race, I took a 6 mile run on Tuesday (race was Sunday) then rested the rest of the week. Training for a half marathon is definitely a time commitment, but only taking long runs every two weeks helped. I felt like I kept up my running fitness in between just fine with those 30 minute/3 mile runs (it actually takes me 35 minutes to run 3 miles). 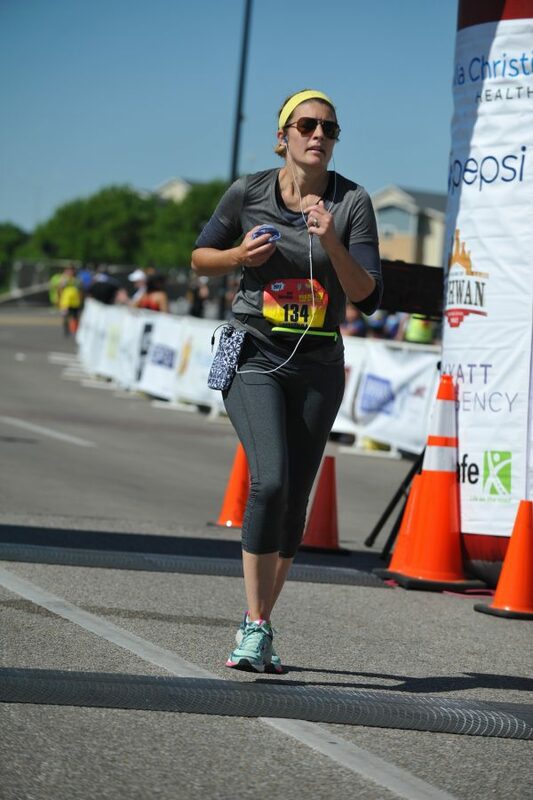 Since I wasn’t particularly sore after running the race, I think that my training paid off. 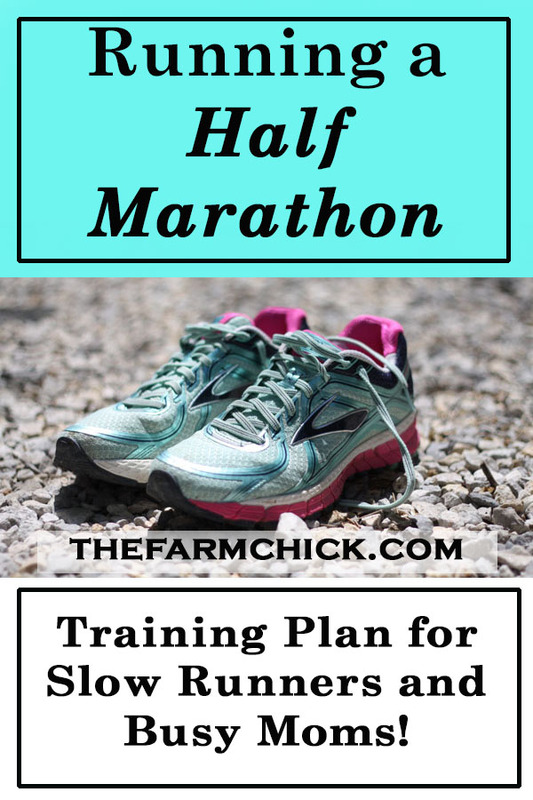 This isn’t probably the training you’d want to do if you were serious about breaking records, but for a busy mom and farmwife, this was quite doable for me! Any additional thoughts about finishing a half marathon? Would you do another one? Thank you for this! I’m a slow runner (around the same pace as you, sometimes a bit slower), who’s also a mom, work a physically demanding job, and also need time to get/ keep my horse in shape & get to barrel races at least once a month. I want to train for the RnR Half in Savannah next November, but there’s a local half I’d love to try in March. I wasn’t sue I could commit to most training schedules that call for 4 runs per week, but I think I can modify one I kind of like to stretch it out & do three days/ week along with all my other exercise (lifting, riding, etc). Thanks for posting this. I keep seeing training plans where you’re told to run 4 miles at an easy 10:30 pace and I’m like COME ON! That’s not realistic or helpful. I’m closer to 50 than 40, work full time, have 3 kids at home. I’m doing the best I can to train for my next half in a few months (and we’re getting more snow tomorrow? Awesome). Amen! That’s what I had found, too! Even on a good day, there’s no way I’m running a 10:30 pace, lol! I loved that training plan and if I ever do another half, I will be following the same one. It worked well for me (at age 37) and my mom (age 60). Good luck with your half! !